Closing Lecture Jae Emerling Tomorrow! 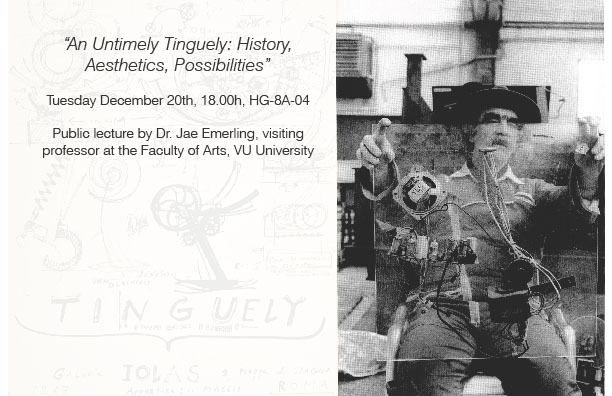 The Visual Arts, Media & Architecture research master programme kindly invites you to attend the lecture An Untimely Tinguely: History, Aesthetics, Possibilities by Prof. Dr. Jae Emerling, on Tuesday December 20th. Jae Emerling is the first Métamatic Visiting Professor at the Faculty of Arts of the VU University Amsterdam, a research fellowship funded by the Métamatic Research Initiative. “An Untimely Tinguely: History, Aesthetics, Possibilities” will be the concluding lecture of Prof. Emerling’s visiting professorship in the Fall of 2011 at the VU, during which he taught a Master Seminar entitled “Tinguely and Transmissability”. Jae Emerling is an assistant professor of modern and contemporary art at the University of North Carolina, Charlotte where he teaches in the College of Arts + Architecture. He holds a Ph.D. in Art History from the University of California, Los Angeles. His research focuses on the intersection between modern and contemporary art and critical theory, particularly as it is embodied in the photographic image. His publications include two books Photography: History and Theory (2011) and Theory for Art History (2005). In 2009 the Métamatic Research Initiative set out to investigate Jean Tinguely’s exploration of the relationship between the artist, the art work and the viewer as expressed in his Métamatic sculptures. Last winter eight artists have been commissioned to undertake artistic research. The artists are now halfway through their projects and will speak in Amsterdam about their art and their commission during the autumn of 2011 and the spring of 2012. In addition to the artist’s commissions, the Métamatic Research Initiative funds a three-term visiting Professorship programma the Faculty of Arts, VU University Amsterdam in the period 2011-2012. The programme is aimed at stimulating and connecting research into the relationship between art and technology after World War II in general, and the work of Jean Tinguely in particular. Three grants have been awarded, respectively to Jae Emerling (University of North Carolina, US; Fall 2011), Emily Scott (Independent scholar, US; Spring 2012), and Susan Holden (The University of Queensland, AU; Fall 2012). More information regarding the Métamatic Research Initiative is available at www.metamaticresearch.info and www.let.vu.nl, as well as on this website.